Normally when we start with a game, we look around on the map for an industry to set up a goods transport service or we look for some large cities to setup a passengers transport. In this scenario there is no industry, there are no large cities, only small villages. The level setting of the game is "Hard". However, something has to be done. 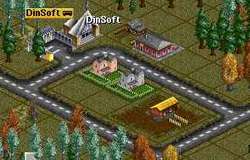 We decide to build our Head Quarter in a small village called "Dinsoft". End of January 1950 the Head Quarter is ready. A few employees live in a neighbor village, Gadtown. So we start the first bus service between Dinsoft and Gadtown. On February 5 the first bus arrives at Dinsoft, without passengers, so no money was earned. On February 28 the bus at Gadtown brought two passengers to Dinsoft. 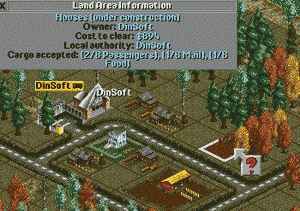 Dinsoft has only 49 inhabitants, Gadtown 146. After the construction of the new Head Quarter and the start of a bus service Dinsoft starts to construct some new houses. The bus service goes on and in the mean time we pay some loan off, to lower the interest paying. During the game we must watch the messages to see if somewhere a new industry is started. Sometimes the bus has a breakdown, the motor smokes and the bus can't drive. A cloud of black smoke comes from the motor. When a vehicle is long without service then the reliability decreases a lot. To avoid too many breakdowns, the time between two services can be reduced. On the road from Dinsoft to Lendhead there is a power station. Such a power station needs coal. This page shows all Game Years one by one. From 1950, to the last one: 2050. In the Control Box below you can browse from one year to another or jump to any of the 100 years. If the Save Game of the selected year is available then there is a Download Button.